CARACAS – Venezuela’s top military envoy to the United States defected from the government of President Nicolas Maduro on Saturday, as the South American nation said the two countries had scaled back their diplomatic missions to skeleton staff. The diplomatic friction and defection was triggered by U.S. recognition of opposition leader Juan Guaido as Venezuela’s interim president. Washington, Canada and most Latin American nations said Maduro’s second-term election win was fraudulent. 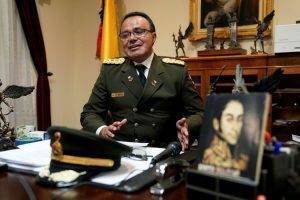 “Today I speak to the people of Venezuela, and especially to my brothers in the armed forces of the nation, to recognize President Juan Guaido as the only legitimate president,” Colonel Jose Luis Silva said in a video recorded at the embassy in Washington, seated at a desk alongside the Venezuelan flag. Venezuelan Colonel Jose Luis Silva, Venezuela’s Military Attache at its Washington embassy to the United States, is interviewed by Reuters after announcing that he is defecting from the government of President Nicolas Maduro in Washington, U.S., January 26, 2019. (We would) “maintain an Interests Office, with minimum personnel, and office of representation of interests as functioned in Cuba. That is true diplomacy,” Maduro said in a live broadcast with Venezuelan youth. “We don’t want to be a North American colony,” he sang during the broadcast, during which he also pounded conga drums.